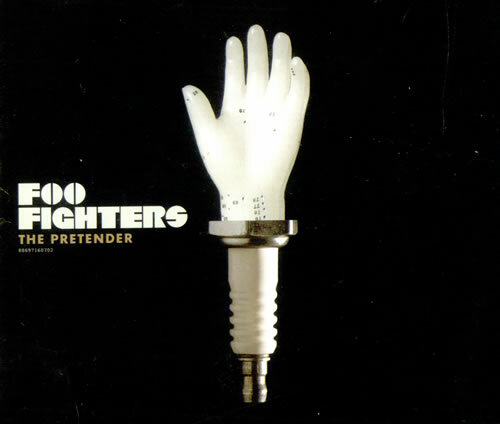 10 Reasons to love: Foo Fighters, The Pretender. – music waffle. If you can’t think of ten, you don’t really love it. 1) First up, I’m full of admiration for anyone with a floor that glossy. I need that person in my life. I suspect it’s was Dave Grohl’s handiwork, because he’s wearing a bandage (he’s probably got a blister from excessive polishing). In fact the whole set looks like a “What’s black and white and red all over” joke). 2) That insistent drum beat at the start. There’s a juggernaut of energy in this song. 3) Dave Grohl’s piercing eyes looking through the Old English Sheepdog mane of hair. He’s definitely angry about something. 5) The chorus demands that you headbang along to it, and frankly I’m too old and it gives me a headache, but the music always wins. 6) A rather menacing police guard appears, soon to be joined by colleagues, their toes twitching on the line like the Dad’s race at Sports Day. There’s a heap of defiance in the stamping left leg of Grohl. The drum beat speeds up as the tension rises through the bridge – visors are dropped, truncheons are grasped and stances struck. 8) … the wall explodes as a tidal wave of water sprays the room, knocking the guards to the floor, but the band play on manfully through the physical and metaphorical red mist. I just hope their insurance covers flood damage. 10) … someone’s got to clean that floor again.